This past weekend there were lots of anglers were out fishing. The fishing for winter (feeder) chinooks was GOOD with lots of 3-5 lb chinooks and some larger ones up to 20.5 pounds. The chinooks have been close to the bottom and glow spoons and bait with glow teasers have been the most effective lures. This notice is a reminder that recreational fishing for halibut under the BC Tidal Waters Sport Fishing Licence will close by regulation effective 23:59 hours December 31 2018. 2019 management actions will be confirmed following the International Pacific Halibut Commission meetings and Sport Fishing Advisory Board of BC meetings in late January/ early February 2019. 00:01 hours March 1 to 23:59 hours March 15, 2019. Salmon fishing was GOOD this past weekend. Most anglers have been fishing from just outside the Secretary Island to Otter Point. The fish have been close to the bottom in 100-150 feet depths. Spoons such as Skinny G’s, Coho Killers and 4″ Coyote spoons have been good. Green and glow has been the hot color combination for spoons. Hootchies in White, Glow/Green and Purple Haze are the top choices in plastic baits. Anchovies and herring have been good as well. Good choices for teaser head colors are Chartreuse, Tiger Prawn and Bloody Nose. Popular flashers have been the Delta Guide Series UV Moon Jelly, Lemon Lime, Madi and the Super Betsey. Salmon fishing was GOOD near Becher Bay. This past week the salmon were between Church Rock and the Bedfords. A 16 lb spring was caught at that location and a 12 lb spring was taken by Whirl Bay. The best depths to fish for springs have been between 120 to 140 feet on the downrigger There have been lots of small springs inside the bay and throughout the area. The fish have not been too picky about what they will strike and anglers are mostly using spoons and plastics for lures. Good spoons have been Skinny G’s, Coho Killers and Coyotes with glow on them. Needlefish hootchies in White, Glow/Green and Purple Haze are the top choices in plastic baits. Large anchovies wee working too and effective choices for teaser head are Chartreuse, Tiger Prawn and Bloody Nose. The GIBBS Highliner Guide Series Outfitters, the Betsey, and Gold Fever Hot Spot flashers have been working well. 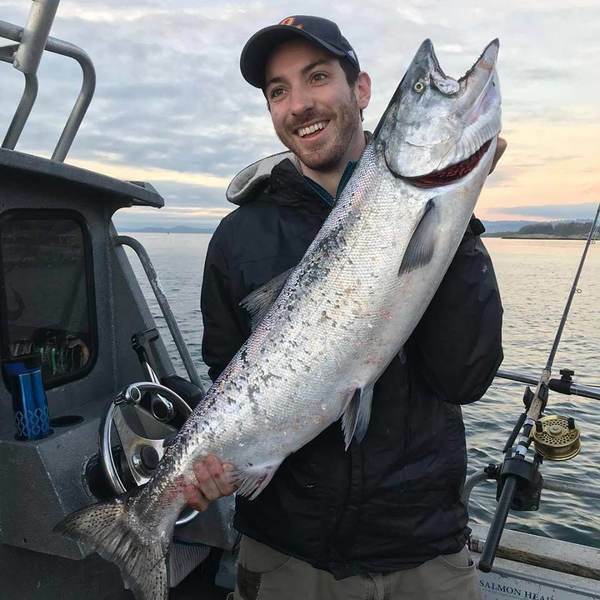 Pedder Bay Marina reports REALLY GOOD salmon fishing in Whirl Bay and inside Pedder Bay near the Green can buoy. Anglers were catching springs up to 9.7 lbs in size and many limits caught within a short time were reported. The fish have been close to the bottom and there is lots of bait in the area. Spoons have been the most popular lures, with the 4” Silver Horde UV herring Aid the “hot” lure. Coyote spoons have also worked well as the fish are targeting herring and not needlefish. Hootchies and squirts are still working with green and glow, Purple Haze or UV white good color choices. Flashers that are popular include the Guide Series Madi, Outfitters and Lemon Lime. Good choices for teaser head colors are Bloody Nose, Chartreuse and Purple Haze. Overall, salmon fishing has been GOOD. There were lots of small salmon from 3-5 lbs throughout the area, but also some bigger ones. Saturday produced the largest fish with a 20.5 lb spring caught off Albert head on a 10 pack anchovy fished in a Green Glow teaser behind a Madi Flasher. Also on Saturday, a 15 lb spring was caught off Clover Point. The salmon have been down along the bottom so most anglers are fishing deep. Spoons are working well with Skinny G’s and Coho Killers in Irish Cream, Brass/Silver and the 4” AP Tackleworks 4” MVP herring spoon good choices. Herring strip was also catching lots of fish. On Sunday, The Local restaurant held their 6th Annual Salmon Superbowl. The winning fish was a 14.4 lb spring caught by Mike Farrally near Victoria Harbour. Second place went to Matt Davidson with a 13.9 lb spring also caught near the harbour. Third place went to Bill Cooper with an 11.9 lb spring. The first place prize was $4,000, second place won $2.000 and third place won $1,000. This notice is a reminder that recreational fishing for halibut under the BC Tidal Waters Sport Fishing Licence will close by regulation effective 23:59 hours December 31 2018. 2019 management actions will be confirmed following the International Pacific Halibut Commission meetings and Sport Fishing Advisory Board of BC meetings in late January/ early February 2019. A nice 20.5 lb winter spring caught on Saturday off Albert Head. The water level on the Cowichan is receding and is in good shape for those drifting the river. It’s close to 1.68 near the lake and 1.45 meters near Duncan as I write this. 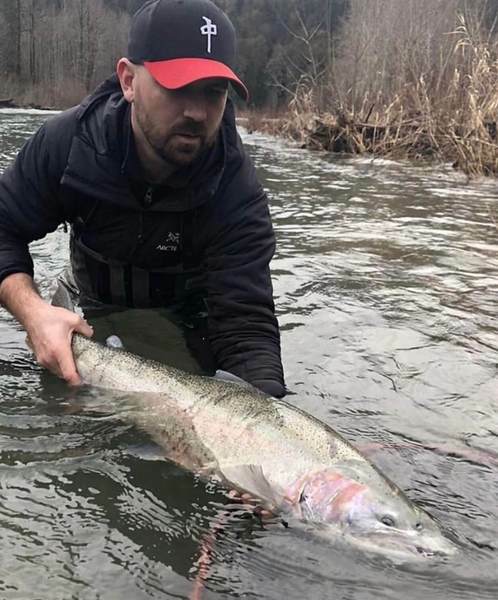 Winter steelhead are now in all sections of the river. However, the Riverbottom area has been the heaviest fished. Cory Arnett released a nice 15 lb steelhead this past week. Most drift boats are hitting a few each day. Trout fishing has been good at the top end. Trout fishing has been GOOD for trout at the local lakes. Shore anglers are catching trout on Powerbait, Gulp Eggs, and worms while fishing close to the bottom. Pink, Chartreuse and Fluorescent Yellow have been good choices recently for Powerbait. Fly anglers are mostly fishing Wooly Buggers, Leeches and Muddler Minnow patterns on full sink fly lines. Trollers are catching trout with worms fished behind Gibbs Gang Trolls and on Gibbs Wedding Bands. 2” Tomic Plugs have also been working well for trout. Bass fishing is SLOW on Island lakes with the cold water temperatures. Soft plastics are a great choice now. The most productive colors in 4” Yum baits are Smoke or Pumpkinseed. Drop shot fishing can be very effective this time of year if you find fish in deeper water. Langford Lake, Shawnigan Lake, Prospect Lake and Elk and Beaver Lakes are the best local bass lakes. St. Mary’s Lake on Salt Spring Island is also a great lake for bass fishing. Cory Arnett released this nice 15 lb steelhead this past week while fishing the Cowichan River. Herring strip is a very effective bait at this time of the year and used by many of the top anglers. Unfortunately, precut herring strip is not available. However, it’s very easy to cut your own strip and there are many videos on the internet on how to do it. Once you learn how to do it you can cut tiny strip to imitate needlefish or make larger herring strip to fish in large strip teasers. We are waiting for the first trout of the year to be weighed in at the store. We are waiting for the first salmon of the year to be weighed in at the store.